Need A Bigger Gladiator Shed? Tough, durable Orient Board flooring for the Gladiator shed. Benefits Of the Asgard Gladiator large metal shed 7x7 ? 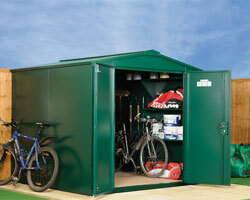 This spacious metal shed measures around 7' 3" deep and 7'4" wide - it's a big shed!